Parents rejoice! Or freak out… depending on which side of the debate you stand on. 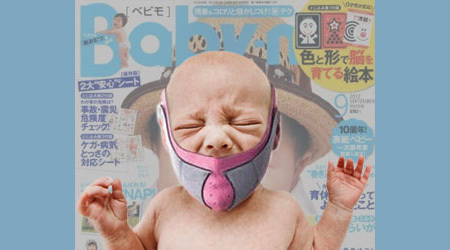 The brilliant minds of Japan have developed the Baby Muzzle, a noise canceling mouthpiece that fits over the head of infants and toddlers ages 0 to 3 years of age. It mutes their cries, fits of rage, shrieks of delight, any esophageal emission that slices through the air, affronting innocent ears. The Baby Muzzle is designed not to prevent children from voicing their discontent, but to merely relieve inconveniences of those within their vicinity from the burden of having to listen to it. A fuzzy pink strapped, mesh, ventilated material with an embedded sound diffuser affixes snugly at the back of your baby’s head with a velcro closure. Once in place, these precious buttercups are primed to be seen, but not heard, nearly anywhere. 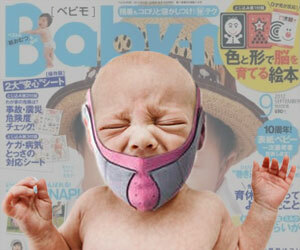 So, do you think the Baby Muzzle is too much? Or do you feel we will welcome it here in the United States of America? Share and comment your opinion!